Many thanks to Bex, who left yesterday after 6 weeks volunteering on the farm. Bex looked after the farm on Sundays to give the rest of us a day off, and also took over chicken duties for three days a week, all of which was greatly appreciated, as well as all the rest of the good work she put in. Anybody who has admired Bex's artwork for the farm (see previous entries) can find more examples on her website www.bexbourne.co.uk. 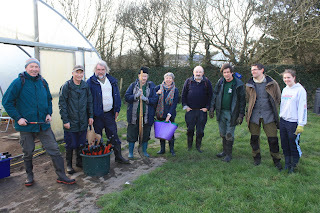 Yesterday, Saturday 25th February, a team of eight began planting this season's seed potatoes. 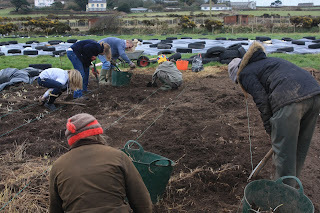 We have planned 20 beds of new potatoes on the market garden field, 10 beds each of Maris Peer (which we grew last year and were delicious) and Pink Fir Apple (a new variety for us). 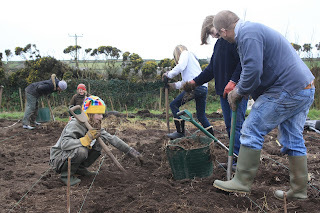 The market garden field is primarily worked by hand - this season's maincrop potatoes will be planted by machine on another field after it has been ploughed by tractor. Preparing beds for new potatoes. The area we are planting was ploughed last May but weeded over again during the year. In September we dug the dock roots out of it and covered it in a mulch of thick black plastic. 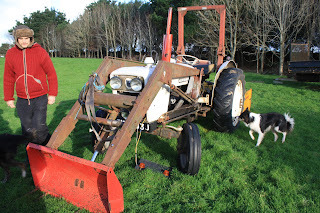 This has had the affects of keeping the soil dryer and more workable during the current wet weather, of warming the soil up, and of killing most of the weed growth, thus reducing our workload now planting has come around (and allowing us to start work one week earlier than last year). The new potato beds, with black plastic mulch in the background. There are still couch grass roots in there, which we dig out and give to the chickens to peck through and destroy, and dandelion roots which our pigs love eating. We hope to have all 20 beds prepared and planted by the end of next weekend, thanks of course to our wonderful community volunteers. A well-earned cuppa out on the veg field. 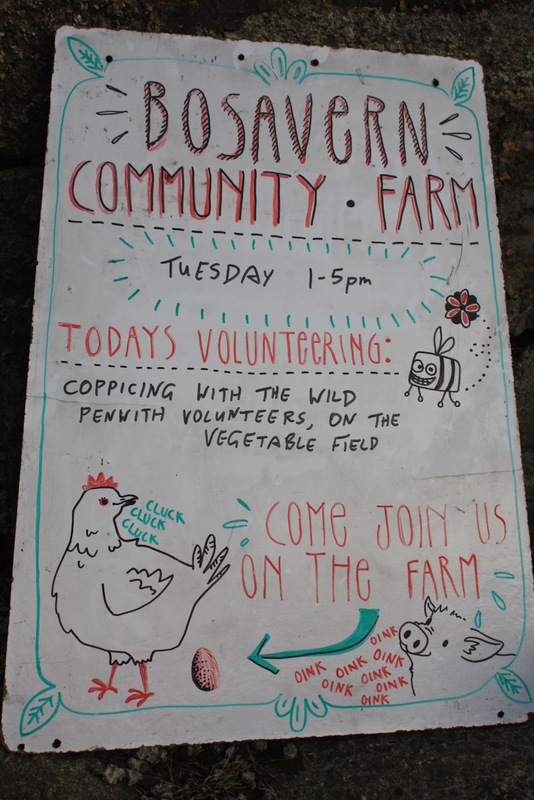 Volunteering/training sessions are held on the farm every Tuesday 1 till 5pm, Thursday 10am till 3pm (bring a packed lunch), and Saturday 1 till 5pm. The farm is a beautiful place to work whatever the weather (on wet days we work in the polytunnels and outbuildings), and as well as meeting new people and helping the farm develop, volunteers learn new skills (land care, animal care, crop care, growing and harvesting vegetables). This month our main task is preparing vegetable beds in the market garden field ready for this season's sowing and planting, some of which has already begun. The first bed of beetroot was sown today, and it was broad beans yesterday. 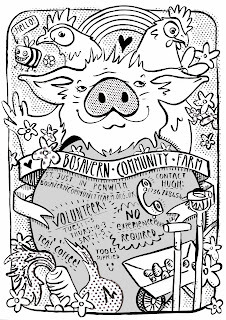 Regular tasks include looking after our kune kune pigs, collecting and boxing eggs, looking after our 200 laying hens, harvesting salads and potatoes/vegetables, composting and weeding. All equipment, including work gloves, is provided, as are tea/coffee and biscuits, but volunteers need to wear suitable clothing and footwear and bring waterproofs "just in case". If you would like to chat to Hugh (Community Farm Trainer) please phone me on (01736) 788454, or simply turn up at the above times and get stuck in. We'd love to welcome you to the team! 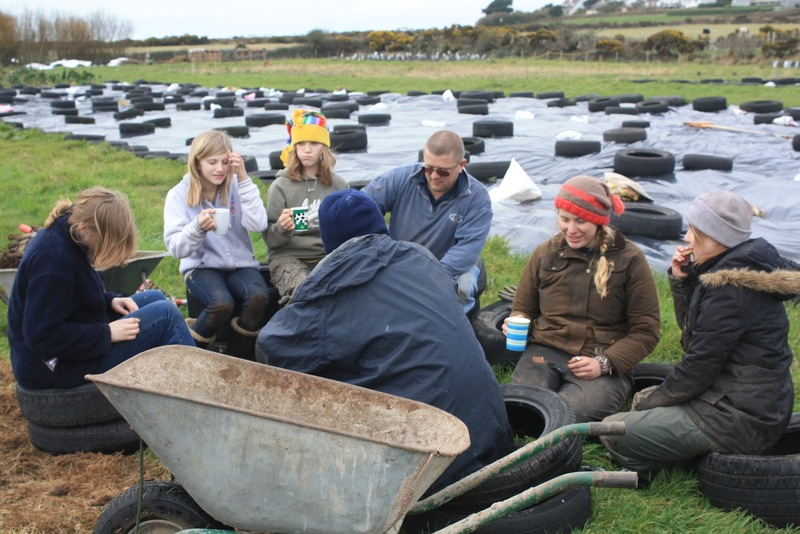 Tea break whilst planting potatoes. Many thanks in anticipation of your kind support (as a charity we are always pleased to receive donations). and a cauliflower (the only item not grown on the farm, but grown by a friend in Gulval, and not certified organic). Please phone Hugh if you would like a box, on 01736 788454. 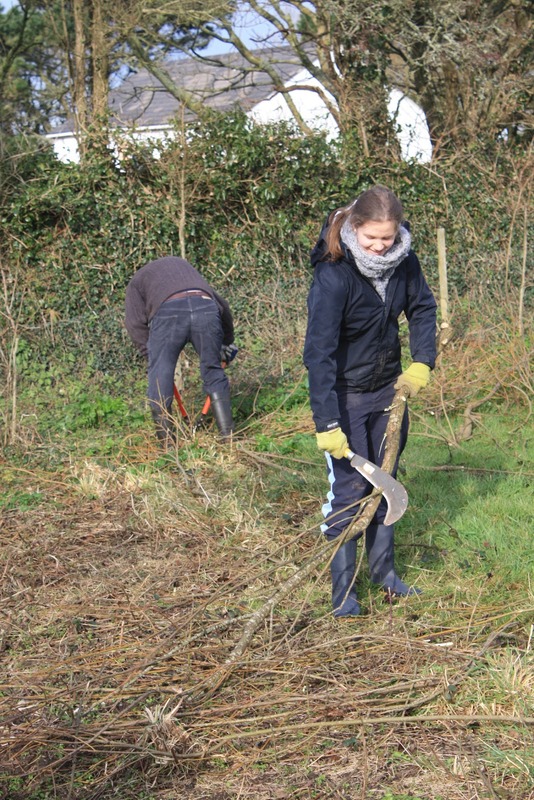 Many thanks to Amy, who left this morning having spent 12 days volunteering on the farm. It's always good to meet someone with a deep appreciation of different salad leaves! 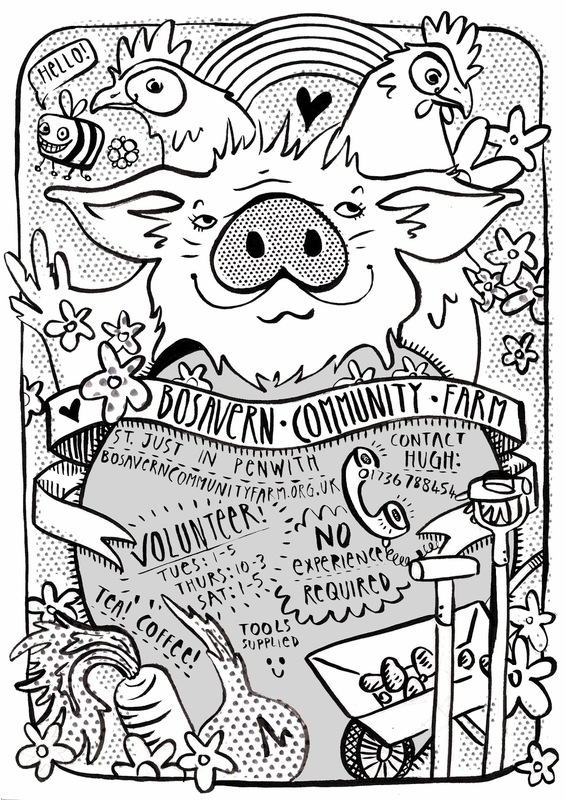 Bex, the farm's current long-term wwoofer, has designed us a new poster which will soon be seen around St. Just and beyond. We think you'll agree that it's fairly funky! Thanks to Bex for her artistic endeavours. 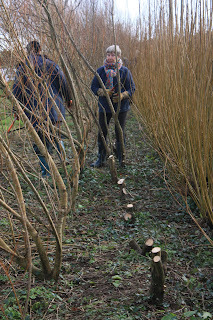 Coppicing willow with the Wild Penwith volunteers (again). It's that time of the year again! Although the spring seems more advanced than at this point last year.... The Wild Penwith Volunteers came on their fifth working day out to the farm today to help us coppice another line of willow, and plant willow around the remainder of our vegetable field. 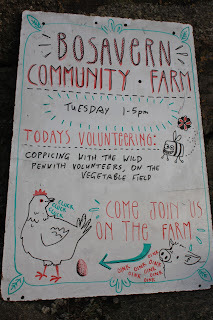 Bex has revamped our volunteering board. 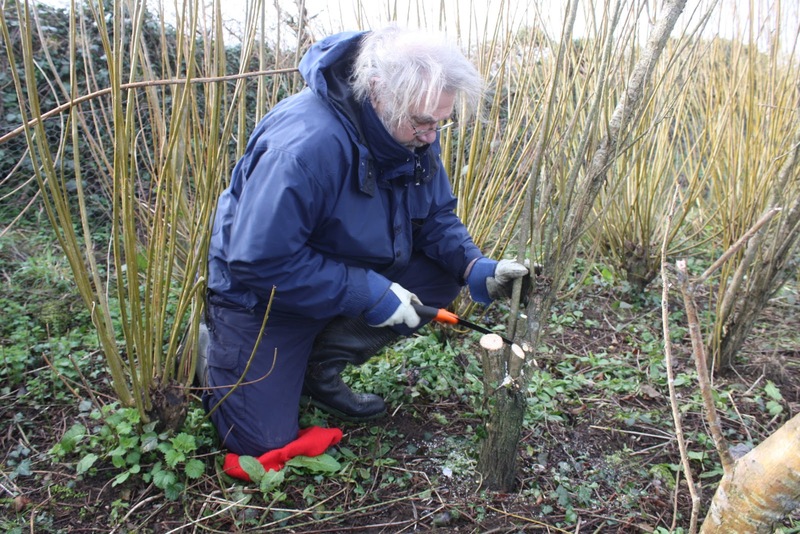 We inherited three lines of willow coppice windbreak on the south hedge of the veg field, and today we have completed planting offcuts of this willow so there are three lines of coppice around the entire field. 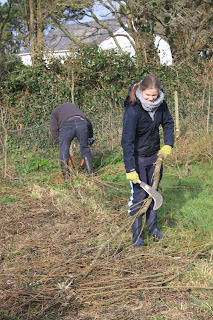 Last year we coppiced the back line and planted along the east and west of the field. 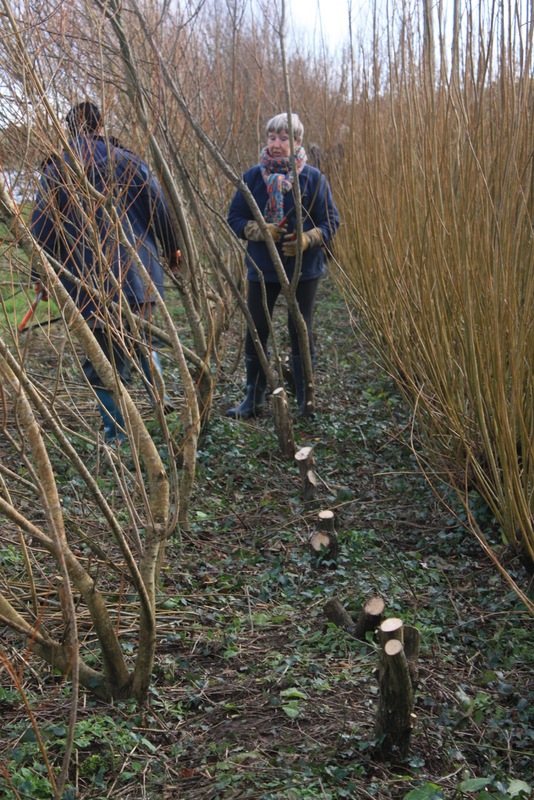 Today we coppiced the middle line and planted along the north of the field. Next year we'll coppice the front and final line, and introduce a windbreak to another part of the farm. Greg Humphries explaining the finer points of coppicing. 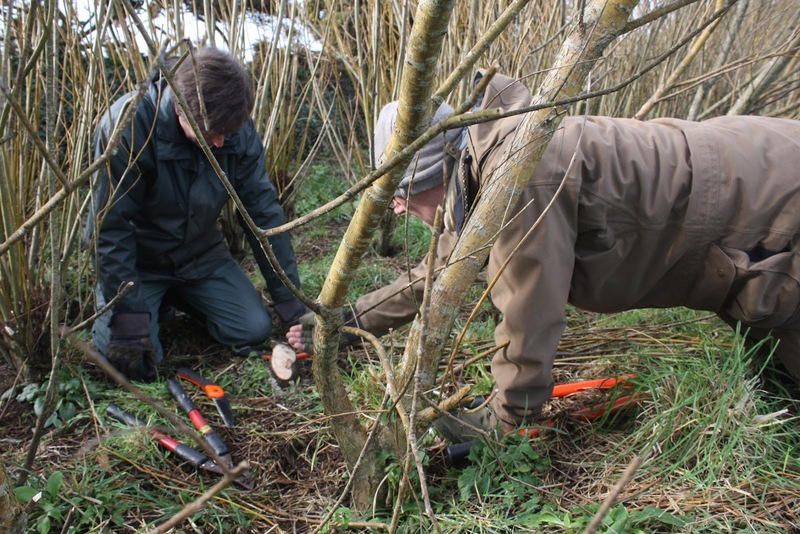 There's a lot more to coppicing than just lopping down trees at the base. 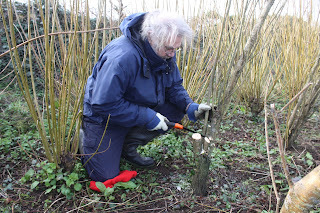 Because we want the willow to be healthy and continue growing and producing we must leave it in good shape, with no avenues for rot to set in, and no damage to the stump. 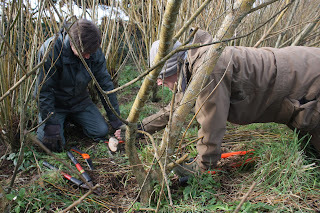 Greg once again was on hand to explain how to coppice correctly. Last year's coppice on the right, this year's in the centre, and next year's on the left. Willow provides a flexible permeable windbreak for the vegetables we grow, a godsend in this incredibly windy part of the country. In addition, the wood we cut can be used as woodfuel, charcoal, pea-sticks, plant supports, or woven into baskets, hurdles etc... or used in green woodwork. A tired but rewarded group of volunteers at the end of the day. Many thanks to Greg, David and all who came to coppice - see you again next year!